Sportswear brand Adidas wanted to embed a positive and creative image with its young audience. This case study looks at how it used Snapchat, via filters, long form video and lenses to drive an 18% boost in store visits. Adidas set out to “Show how creativity in sport has the power to spark positivity in the world.” To turn that idea into a movement, adidas needed a storytelling vehicle that let millions tap into its positive message and express it their own way. Snapchat had the creative tools, engaged audiences, and the scale to realize such an ambitious campaign. Snap Ads gave adidas the power of vertical video to spread the “Here to Create” message to the masses. Top Snaps featured world-famous athletes praising the force of creativity and encouraged Snapchatters to swipe up and watch a long-form video of inspiring high school athletes showing off their skills. To maximize engagement, adidas served Snapchatters the ads most relevant to their favorite sports with Sport Snapchat Lifestyle Category targeting. And the contextual alignment adidas found placing the ads in the high school football Two-a-Day Story resulted in higher performance than the ads in the rest of the campaign. 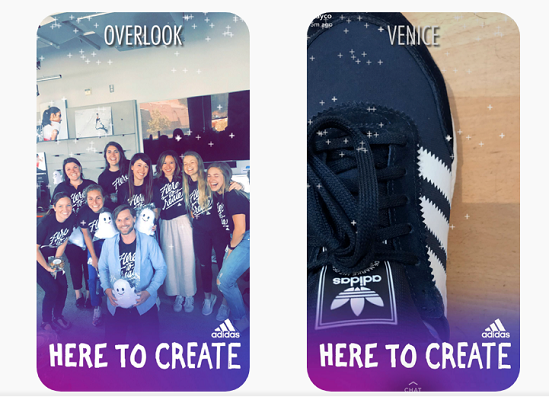 To get Snapchatters to adopt and advocate the “Here to Create” movement themselves, adidas launched local Filters that featured the campaign message. Enabling the Filters to display Snapchatters’ neighborhood not only reinforced local pride, it encouraged other Snapchatters in the area to use the Filter and spread positivity in big numbers, too. Lenses offered Snapchatters an interactive way to further spread the “Here to Create” message. The selfie Lens, targeted at high school and college athletes, encouraged users to engage by raising their eyebrows, which triggered a ball of their choice to bounce on their heads. Users showed how they can be creative in sport by recording their own interpretation and sharing it with their friends. The World Lens component featured many plus sign graphics floating in users’ space allowing Snapchatters to spread their positivity in the environment around them. adidas succeeded in getting athletes of all ages and skillsets excited about the “Here to Create” campaign and outperformed the norm for Message Awareness by 2.6 times. In turn, this led to real sales too; in the months following, 18% of new visitors to adidas stores went as a direct result of the Snap Campaign.